"Absconded" prisoner Frank Dryman was captured and charged with the 1951 murder of Clarence Pellet. (CNN) -- For Clem Pellett, tracking down his grandfather's killer was not his original mission. "I was just putting together an old family story ... and these serendipitous events happened, and we accidentally caught him," Pellett, of Bellevue, Washington, told CNN in a phone interview Wednesday. That "old family story" focuses on two men: Clarence Pellet -- a grandfather that Clem Pellett never knew -- and a drifter named Frank Dryman. According to the Montana Department of Corrections, on April 4, 1951, Clarence Pellett picked up a hitchhiker near Shelby, Montana. The hitchhiker was Dryman, then a 19-year-old drifter who was carrying a loaded gun that, according to the state, he used to shoot and kill Clarence Pellett on the side of windswept Montana road. Dryman took the car and drove to Canada, where he was later arrested for the murder, according to the Montana Department of Corrections. 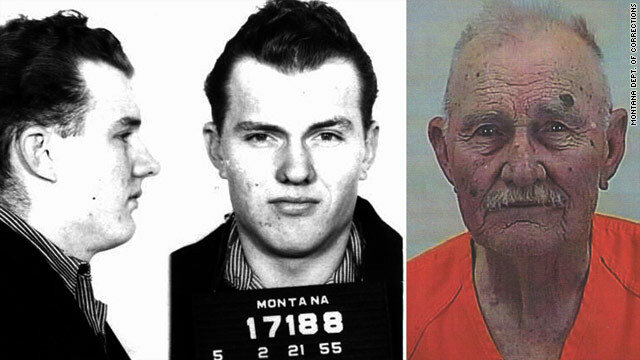 After several trials and appeals, Dryman was convicted in Montana and sentenced to life in prison, then paroled in 1969, according to state records. Less than two years after his parole, Dryman was listed by the Montana Department of Corrections as "absconded." He had disappeared. And that is where the "old family story" stopped for nearly 40 years, until last year when Clem Pellett came across some old newspapers clippings of the murder, which had occurred two years before he was born. "So what I knew of it (was) 'never pick up a hitchhiker,' and 'your grandfather died begging for his life,'" he said. "It's hard -- this is someone I never knew, but as I read, I thought, 'You know, this poor man who happens to be my grandfather -- his death just got kicked to the curb,' and that became the issue." Over the course of a year, Clem Pellett worked closely with the Montana Parole Board and with Department of Corrections officials, who supplied him with an old post office box number in Glendale, Arizona, and details about Dryman's unique knuckle tattoos. That old address was just enough to give private investigators hired by Clem Pellett the lead they needed, and the search for Dryman was on in earnest. Pellett never imagined it would turn out the way it did, though. "We thought he was going to be dead," he said. But 78-year old Frank Dryman proved them wrong. With the help of several private investigators, the search ended when Dryman was found living as a notary public and operating a wedding chapel in Arizona City, Arizona. In the sparsely populated land between Phoenix and Tucson, Dryman had "flown under the radar for years, but he didn't fool me" says private investigator Patrick Cote. "What I really wanted to do (was) check his hands -- for the tattoos. I knew that this fellow was probably the one, because I was looking for the letters L-O-V-E tattooed on his knuckles. And I could see he had old stars tattooed on his fingers to cover 'love.' I called up to the other investigator and said 'I think I got your guy,'" said Cote. Pellett informed Montana Parole Board officials and they worked quickly, contacting local law enforcement in Arizona. Dryman was arrested on Tuesday and is now awaiting extradition proceedings to Montana. "Whatever the justice system does I'm happy with it," said Clem Pellett. "Whatever happens, happens."